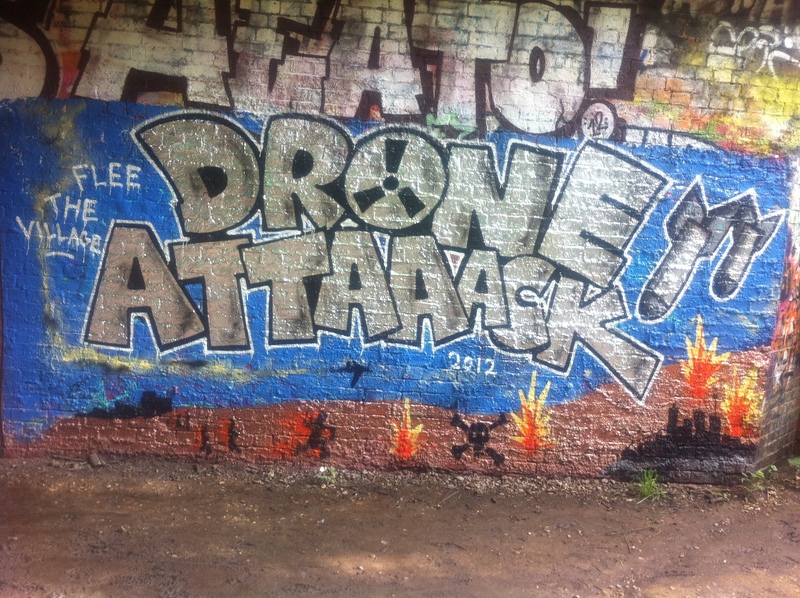 About half an hour ago I spotted this painted on a bridge on the abandoned railway line that runs from Finsbury Park to Highgate. I find it interesting how remotely piloted aircraft (‘drones’) are perceived. In the last 12 years, the concept of drones has become a household idea that everyone is familiar with. To many, they symbolise war without responsibility, and it is certainly true that they have been used in deniable actions in Pakistan and Somalia (among many other places). In a more abstract way, they bring to mind the intruding, data-hoarding big governments that many fear. The fear and distrust of them is part Luddite and part well founded. A secret US spy drone, a Lockheed Martin RQ-170 Sentinel, went down in Iran 2011. 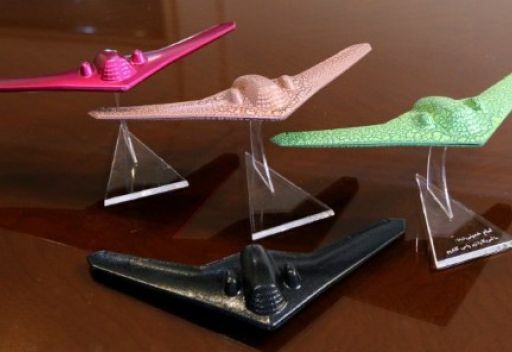 One response to this event, by an Iranian government-sanctioned satirist, was to send a pink toy version of the aircraft to President Obama. “He said he wanted it back and we will send him one,” Reza Kioumarsi, the head of cultural production at the Ayeh Art group said on Iranian state radio. The 1:80 scale toy versions, available in several colours, have proved popular in Iran and are sold on a stand eblazoned with the rather charming Ayatollah Khomeini quote: ‘We will trample America’.